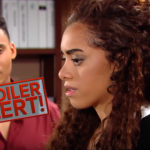 “Bold and the Beautiful” (BB) spoilers for Thursday, February 7, 2019 tease that we will have a day filled with one breaking down, another questioned, and let’s not forget plenty of drama. We have a very eventful day coming up and you will not want to miss a moment of the action! Liam Spencer (Scott Clifton) finally breaks down and expresses his feelings of guilt to Hope Logan Spencer (Annika Noelle) regarding the loss of Beth. Liam has tried his best to be so strong and hold it together so that he could be there for Hope in her time need. He didn’t want to break down and make matters worse for Hope, but he will not be able to keep up the facade anymore. Liam Spencer will finally break down and let his feelings out. He will start the grieving process for his daughter and will lean on his wife, Hope Logan Spencer for support. He has tried to deal with things by being strong and being there for others but now it’s time that he has someone be there for him. Bold and the Beautiful spoilers tease Liam will feel guilty for not being able to be there with Hope while she gave birth to baby Beth and wishes he could’ve been by her side and thinks if he would have things may have been different. Do you think it would have? Other “Bold and Beautiful” spoilers suggest that Wyatt Spencer (Darin Brooks) and Sally Spectra (Courtney Hope) query Steffy Forrester Spencer (Jacqueline Wood) after noticing a resemblance between Kelly and the new baby. Bold an the Beautiful spoilers show Wyatt and Sally will notice how much baby Kelly and baby Phoebe look alike and will start to get curious. Do you think with these questions being brought up it will make them want to look more into things?